In Columbus, Indiana, two thousand pieces of limestone sit over a three acre plot of land, each carefully arranged to form an intricate circle. Another Circle, an installation for Mill Race Park, is just the kind of project design firm Aranda/Lasch welcomes. 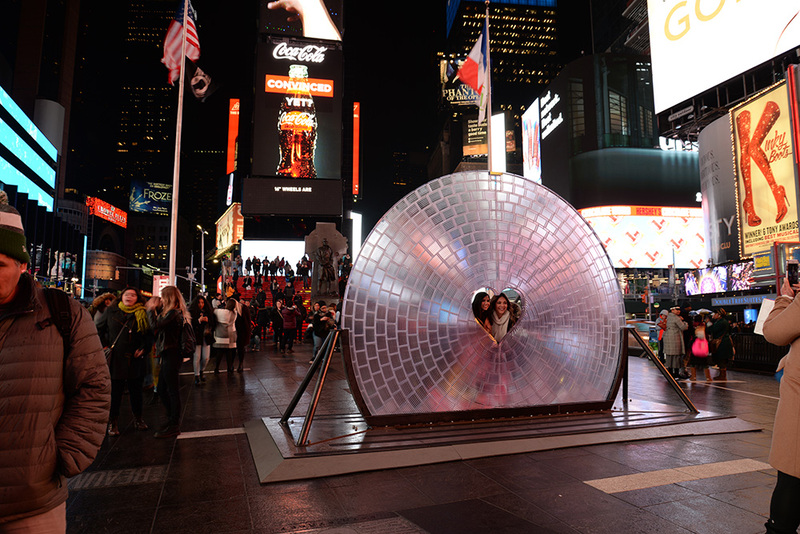 Window to the Heart is the design firm’s latest challenge: make the world’s largest lens, and put it in Times Square. Aranda/Lasch and Formlabs head of design Marcelo Coelho teamed up to conceptualize and create the lens, on display throughout February 2018, in response to this year’s Times Square Valentine Heart Design Competition. Follow their journey from idea to installation in the video and interview below. Follow Aranda/Lasch and Formlabs’ journey to design, 3D print, and construct &ldquo;Window to the Heart&rdquo;. Why did you choose to build a lens for Times Square? Ben Aranda: We live in a culture experienced through screens and cameras. Times Square is a temple to this media culture. But in this culture only the image is celebrated. In Times Square, only the screens are big. The unspoken hero in this media culture is the lens&ndash;behind every image is a lens that captured it. By making a lens that's very large, we want to remind people that when they capture things with their camera&ndash;when they're taking selfies&ndash;what they are doing is seeing reality through a lens. They're capturing it, they're distorting it, they're sharing it. In this important public space, the power of a lens is that it make people aware of the mechanics of seeing. That's what this project became for us. It became a way to relearn. What is seeing? How do the optics really work? How do you make a lens? How do you make a lens that's really large? How do you 3D print a lens? All of this, maybe the more challenging and technically interesting parts of the project, ladder back to one realization: if we make something that is an inquiry into seeing, then it'll work in Times Square. Marcelo Coelho: We started with a simple and magical idea&ndash;to build a giant lens&ndash;and the ideal evolved as we iterated and learned about the realities of making something like this. It's very much a man versus nature process. You are struggling with the limitations of the physical world. You're struggling with gravity. You're struggling with properties of materials and how they come together. The way that we think and go about it is very objective and very scientific. We have hypotheses of what we think is going to work. We test those, reject the failures, and once we have positive answers, we know that we can use those processes in the bigger design. Being able to prototype and manufacture the lens using the same 3D printing process and materials is at the core of making all of this possible. 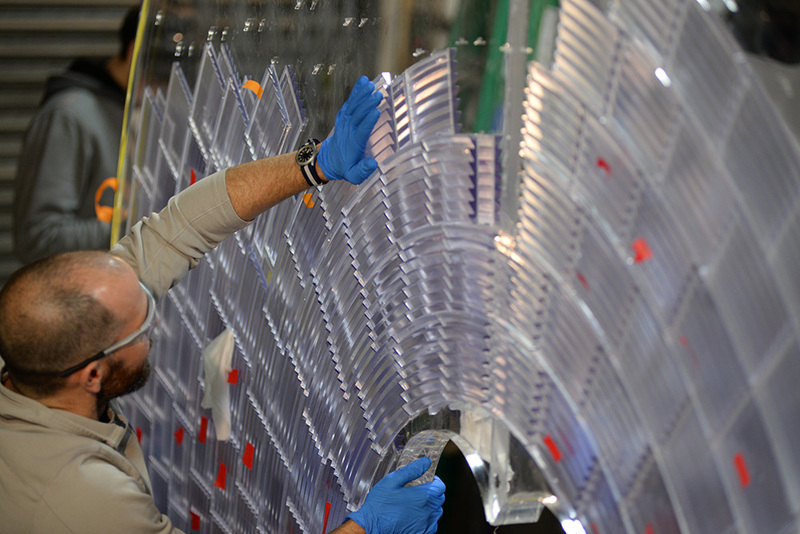 The team tested countless tile designs for the large-scale Fresnel lens, 3D printing prototypes that would eventually evolve into the final tiles. Joaquin Bonifaz: We tested extensively. What's amazing about rapid prototyping is the speed at which you can test. We used powerful computer software, and we were able to iterate in the computer quite extensively. The software allowed us to test the optics, but it wasn't enough. Being able to test a clear product out of a 3D printer was quite a big step. It was crucial to what we were trying to do. We were able to understand the strength of the material, the smoothness or resolution of the print, and the optic effects from a single prototype printed quite rapidly. It was really fast. At Aranda\Lasch, with a single printer we could test concepts at scale and individual tiles overnight. Formlabs was able to print several tiles simultaneously, and within a couple of days we could see the effects of large aggregations of tiles. Just few years ago that would've taken much longer; probably a matter of weeks or months, rather than days. Formlabs was able to print several tiles simultaneously while Aranda\Lasch tested concepts, and within days both teams could see the effects of large aggregations of tiles on the installation. Beyond prototyping, why did you decide use 3D printing to manufacture the final tiles? Aranda: Fresnel lenses were traditionally made with glass. We wanted to try something more 21st century. 3D printing offers a few advantages. One, you can run a lot of printers in parallel. It points to where manufacturing wants to go, which is a more distributed model. You're able to build very large things through this distributed manufacturing possibility. Another advantage is that the printing resolution replaces the need to polish each individual tile, as it would have been traditionally done with glass. And, finally, 3D printing allows us to have a wider variety of geometries, since there is no need to create molds in which to cast the glass. There is basically no tooling. Bonifaz: We're used to dealing with bigger pieces, but they're made out of materials that take a lot longer to iterate. With this technology, we can actually print the real part many times over, because it's low cost and super fast. That made a big difference in the design process. 3D printing helps us push the boundaries of what we can do. 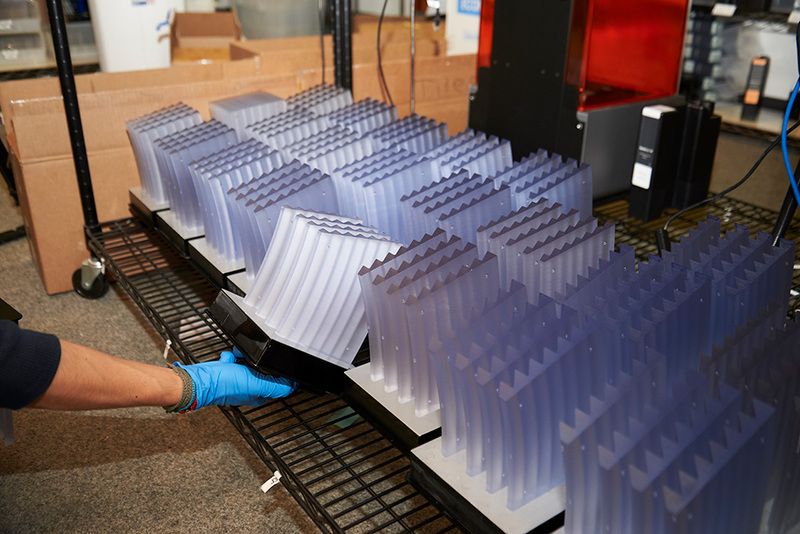 Running several Form 2 3D printers in parallel allowed the team at Formlabs to produce the large quantity of tiles required to build the lens. What were some of the challenges of designing at such a large scale? Aranda: The challenges of building at this scale are really the challenges of building in the city. How you deal with the constraints of keeping it safe? It's out in the open. People can touch it. People can run up to it. They can push it. But this is what public art has to do. Public art always has to deal with the public sphere. I always see these things as fun challenges. If constraints bother you, then that's not design. Design is dealing with all of these limitations of materials, logistics. Coelho: Safety was an important consideration. We decided to have an acrylic core because we wanted to make sure that this lens is structurally sound. It's in the middle of Times Square. It needs to withstand strong winds, rain, snow and there are 400,000 people a day that walk by, so we wanted to make sure that this wasn't going to fall and potentially hurt somebody. The lens was constructed with a sturdy acrylic core seated in a metal cradle. Tiles were carefully placed in 13 concentric circles over the acrylic to create the Fresnel effect. Bonifaz: One of the challenges was the accumulation of errors in the spacing. 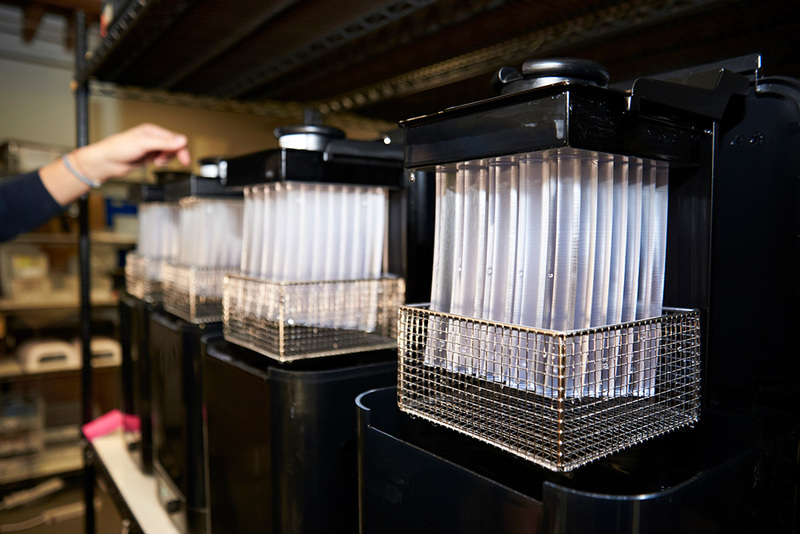 The lens is made of many small parts, and if we start accumulating small inaccuracies on every step, they will add up quickly and result in the final pieces not fitting. Another challenge was the adhesion of the tiles to the acrylic surface. This turned out to be more complicated than we thought and took quite a few steps to resolve. There were problems with bubbles, movement, and opacity we were able to solve them through extensive testing. There is always a moment in the construction process where planning and execution meet on site. At that moment you are going over in your mind every variable accounted for, but you can’t really know if the parts will fit until they come together. For Window to the Heart, there were over one thousand hand placed pieces that all had to fit within three millimeters of each other. It was a little more stressful than other projects, but with high risk came high reward. “Window to the Heart” is composed of nearly one thousand 3D printed tiles. What do you want visitors to Window to the Heart to take away from the piece? Aranda: We are so sensitive now to optics; to camera angles, to lenses. I really hope that when people see this piece, the first reaction should be like, &ldquo;Whoa, what's going on here?&rdquo; There's this sort of trippy image, warped image of Times Square. But we imagine a more sustained reaction would be that people start to learn how optics work. It's not something that's happening in a computer. It's not something that's necessarily digital. Rather, it's about light traveling through material. That bending through matter is what constructs our image of the world. Visit “Window to the Heart” in Times Square throughout February 2018. 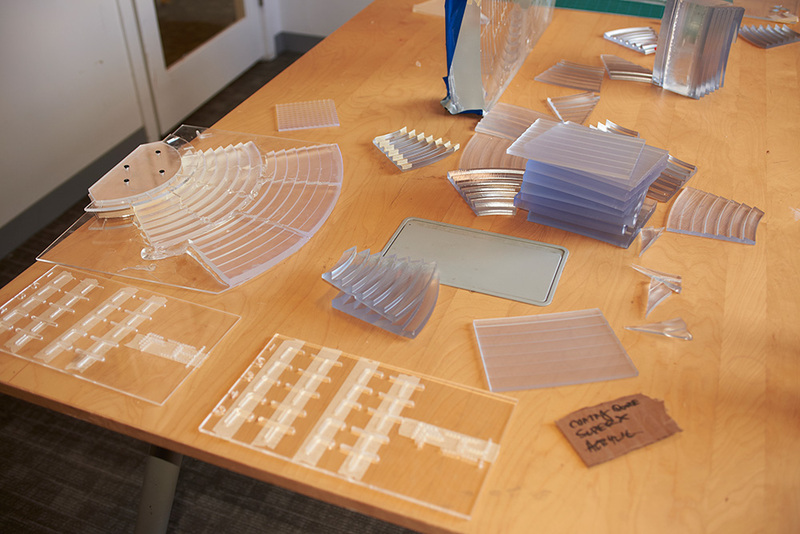 Learn more about Clear Resin, the material the Aranda\Lasch and Formlabs teams used to 3D print the tiles for Window to the Heart. Request a free sample part, or explore techniques for post-processing parts printed in Clear Resin to be transparent. Sign up for the Formlabs newsletter to keep up with the latest in 3D printing design and production.